Scared of clowns? You will be! 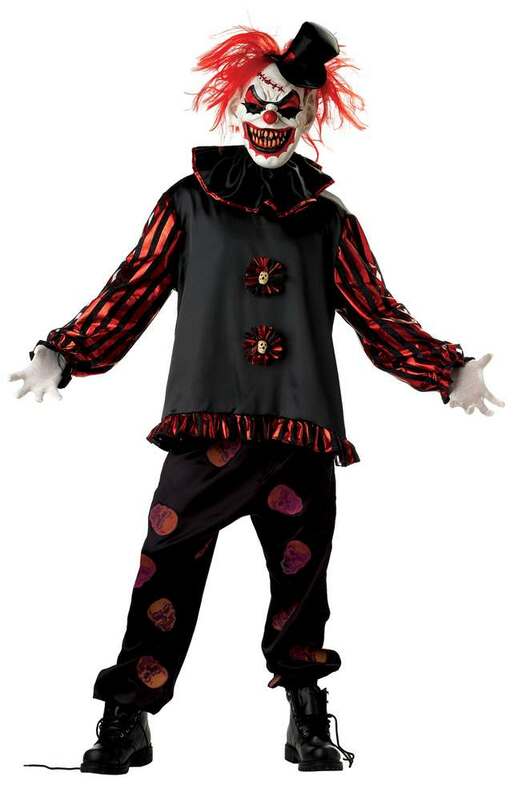 Demented, grinning evil clown Halloween costume includes long sleeve shirt, screen-printed skull pants, mask with hair, hat, and neck ruffle. White gloves sold separately. Fits mens size large (42-46). Measurements of this costume are as follows: With it laying flat on a table, the pants measure 45" long from waist to cuff. They have an elastic waist that can fit up to 40" maximum. The shirt measures 50" around the chest, with a length from shoulder to waist of 27". Around the upper arm measures 18". This is a great purchase! Extreme scare!!! Well made product too.